Scania is launching its fourth Australia-wide search to find the country’s best truck and best bus driver, with a prize worth $10,000 on offer for the winner of each category. Australia was one of the first countries to run concurrent truck and bus competitions in 2012, and the success of these events has prompted the extension of the bus competition into other markets. Online entries open on March 24 with a registration phase, with the first of the on-line qualifying multiple-choice and open-ended questions to follow soon after. The most successful entrants graduate to the second round of online questions in July, with the top 12 finishers invited to the national final. This will take place in early October on the Queensland Gold Coast for both truck and bus drivers. “Scania believes the driver is the single most important asset for economy, environment and safety,” says Ron Szulc, Scania Australia brand & communications manager. “The competition testing will place emphasis on efficient and safe driving practices as well as reinforce the values of driving with a positive attitude. “The Scania Driver Competitions have become well known around the world as a test of skill and agility, both practical and mental. “We are once again inviting drivers who feel they have above average ability behind the wheel to get involved and show off what they can do. The competitions are open to all drivers who have an MC licence for trucks or an HR licence for bus. Entries are not restricted to drivers of Scania trucks or buses; all drivers who fit the criteria are welcome to participate,” he says. 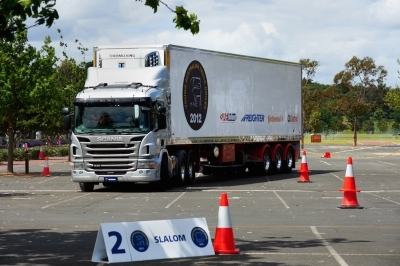 “The competition will test competitors’ knowledge of the road rules, specialist rules relating to truck or bus driving, as well as being able, in the national final, to present themselves as impressive ambassadors of their chosen profession. “As in the past, the national final will bring together a group of highly motivated and knowledgeable drivers who will undergo on-road testing of their driving ability, manoeuvring tests to show their low-speed positioning skills, as well as a test of their practical knowledge and their ability to talk about their profession in a media interview-style environment,” he says. The focus is not confined to driving skills but takes in knowledge of safe procedure at accident sites, as well as knowledge of laws relating to load security (for truck drivers). The Scania Driver Competitions will be held in 40 countries around the world this year, and is one of the biggest of its type. In the 10 years the event has been in existence, more than 200,000 drivers around the world have taken part, and the aim of attracting 85,000 drivers this year marks a step-change in the level of intensity with which Scania is promoting it. As an example, in 2012 around 45,000 drivers took part. Drivers are urged to visit the Scania Driver Competitions website to register their interest.